My Dentist wants to drill all of my teeth down for crowns to fix my TMJ. Is this normal? 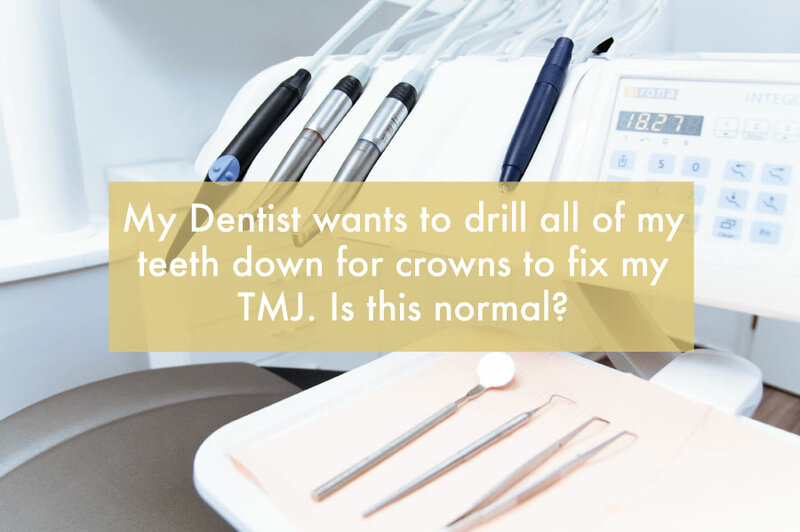 Question: My Dentist wants to drill all of my teeth down for crowns to fix my TMJ. Is this normal? Answer: Some patients will go to extreme measures to seek relief from TMJ (Temporomandibular joint dysfunction) pain. As well, there are doctors who will go to extreme measures to systematically treat the disease via a cookbook approach. It is easier to treat a patient when you can pinpoint a disease and automatically assign a standard treatment to solve the problem. The danger in looking for a fix-all in TMJ disease is that there are 3 main causes of pain in the TMJ and they all require different treatments. sheath. They feel the best way to treat it is to "rebuild" the mouth and find the most comfortable position for the teeth when the muscles are relaxed. This comes with a high price tag and permanent loss of enamel. The key is to have a TMJ evaluation completed by more than one dentists that has experience treating the disease to seek out different opinions and treatment options. I recommend starting with the most conservative and cost effective treatment choices to start and hen get more aggressive if your still are not seeing results. You can't put enamel back on your tooth once it's drilled away. Are there any alternatives to high priced procedures that will improve my smile?